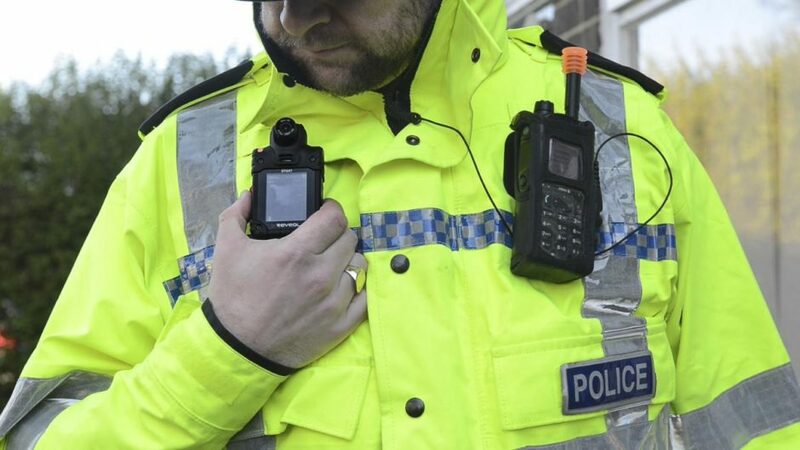 One of the UK’s smallest police forces, Durham Police, is reportedly gathering video captured by officers’ body worn cameras to create a ‘troublemakers’ database – contravening national guidance that officers should not use the technology as an ‘intelligence-gathering tool’. Body Worn Video cameras, or ‘bodycams’ as they are more usually known, are now a global phenomenon. Most UK police forces use them routinely, as do forces in the US, Australia and Europe. Nor is it just the police that is using this technology: bodycams are routinely worn by bailiffs, security guards, even traffic wardens and council workers. This is arguably one of the biggest single expansions of surveillance capacity since the introduction of CCTV, and one that is highly profitable for bodycam manufacturers such as Axon (formerly Taser International). Privacy campaigners (including Netpol) have for some time argued that the police use of bodycams raises serious privacy and civil rights issues. Criticism has been largely deflected, however, by assurances given by policing and oversight bodies. In line with human rights and data protection principles, they have said, officers cannot use bodycams to record the public in their day-to-day activities, but only to record criminal and other incidents. Police forces must normally delete any footage not required for a criminal investigation, or for investigating a complaint against the police, within 31 days. The footage is, therefore, being used for purposes very different to the investigation or prosecution of a specific criminal act: the database is clearly intended as a long-term intelligence resource. Some of this footage is taken during police stop and search operations. Instead of deleting this footage, as is normally required, Durham Police intends to retain it as ‘intelligence’.and disseminate it to other police officers. The aim, as Chief Constable Barton told the Times, is to ensure ‘our cops [know] what they look like when they’ve turned their back on the police car and they’re walking away’. Officers use the relatively new bodyworn video technology to film suspects when they are stopped and searched and also during arrests. While videos are usually deleted after a month unless they are needed for a criminal prosecution, they are kept longer in Durham in the case of suspects who have committed previous offences. Durham Police justify this on the basis that they are focusing only on people who have ‘committed previous offences’. It is far from clear, however, that the retention of this kind of personal data becomes necessary and proportionate merely because someone has previously offended. Nor is it clear how broadly this is defined. Does this mean any conviction, no matter how minor? Or how long ago? Is it limited to those convicted in a court of law, or does it include people who were arrested, charged or suspected of offences? Or those who have accepted warnings or cautions? Durham Police’s bodycam database represents a stark departure from operational guidelines issued by the College of Policing in 2014 [ , 1.3 Mb]. These guidelines state that any retention of images taken by bodycam beyond the standard 31 days ‘must be justified and the justification must be compelling’. It also states that bodycams should not routinely be used to obtain ‘intelligence’ that is unrelated to criminal prosecutions. 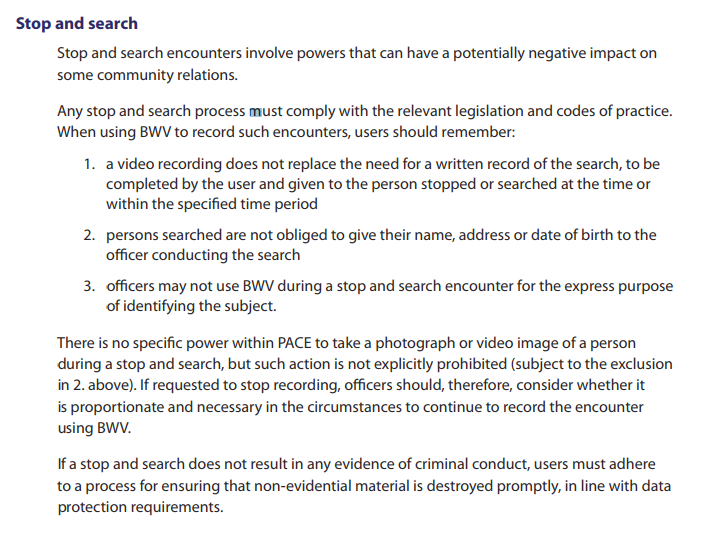 The guidelines also make specific reference to the use of bodycams during stop and search operations. These suggest it may not be ‘proportionate or necessary’ to use bodycams at all; that the footage should not be used for the ‘express purpose of identifying the subject’; and that where there is no evidence of criminal activity, footage must be destroyed. The fact that Durham’s Chief Constable endorses the production of ‘intelligence’ footage from stop and search encounters, against the guidance issued by his own professional body, is particularly disturbing. It is well-documented that black and ethnic minority groups are significantly more likely to be stopped and searched, with black people more than six times more likely to be searched than those who are white. In such circumstances, any image database compiled with stop and search footage is likely to further entrench discrimination. 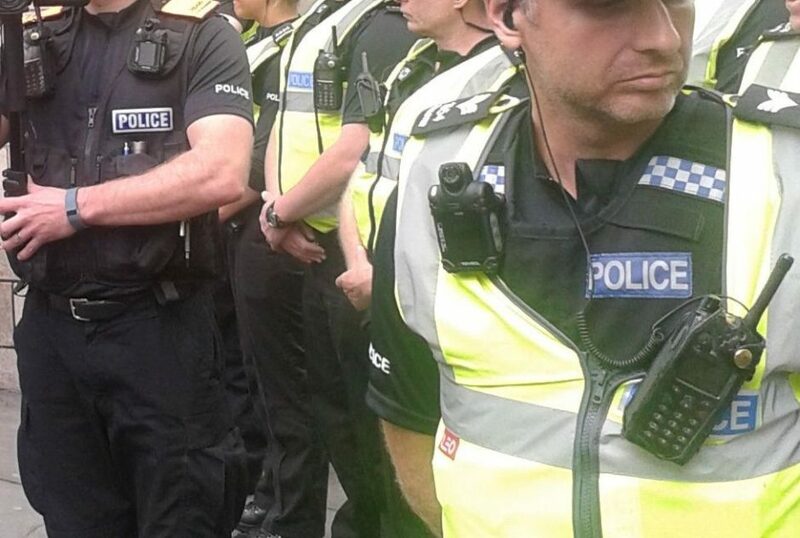 Allowing police forces wide discretion in the use of bodycams for ‘intelligence’ purposes also raises many significant and serious privacy and civil rights issues relating to the right to protest. Campaigners have experienced (and frequently challenged) routine police filming of protests for many years. 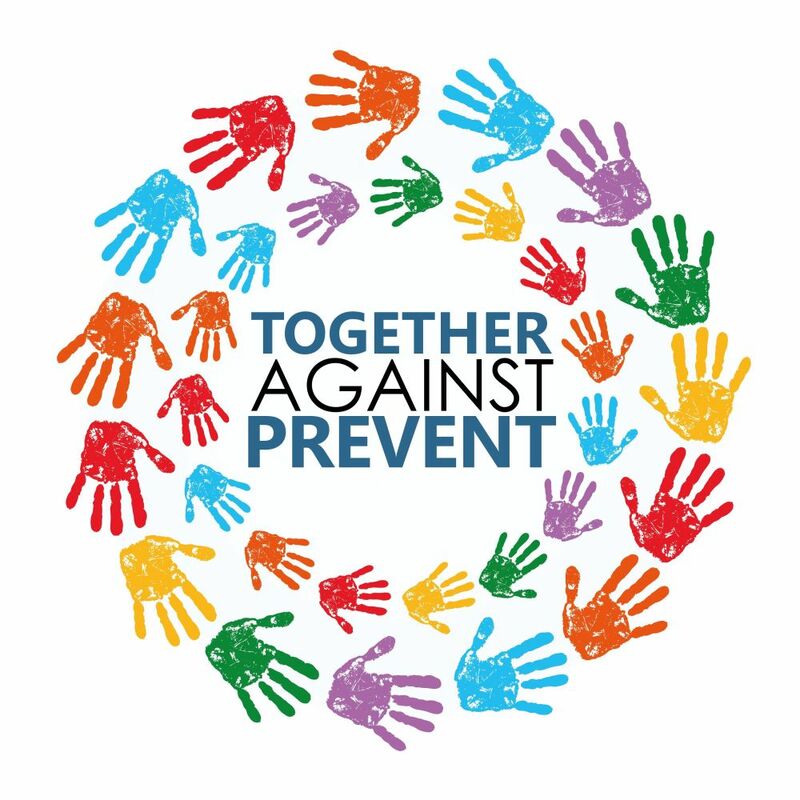 Increasing and extending the deployment of bodycams in these circumstances risks more unjustified interference with rights to both privacy and freedom of assembly. There are troubling indications that this too may already have started. Legal observers at the recent Sisters’ Uncut occupation of Holloway Prison’s visitors centre in May witnessed police try to insist women gave their personal details as a precondition for exiting a ‘cordon’ around the building. When protesters refused, they were told officers would instead use their body cams to photograph anyone leaving. Both the Information Commissioners Office and the College of Policing have been approached for comment on the activities of Durham Police. Neither has yet responded. Netpol will continue to press them on this, and to campaign for clearer, stricter and more enforceable rules relating to the circumstances in which both bodycams and the footage they capture is used.